In this free special report, I’ve put together a half dozen actionable items that can make the difference between cruise vacations that are memorable and others that fail to measure up to all you had hoped they would be. I’ve cruised on hundreds of ships, as a solo traveler and with family and friends. Which cabin/suite is best? Should you pony up for a balcony cabin or save money by booking an inside or oceanview cabin? Big Ship or Small Ship? Which has the potential to give you the best experience — and the most bang for your buck? Upgrade your seat. How to save and travel in comfort getting to and from your cruises. I’ve saved thousands using these techniques. Don’t worry. By submitting your name and email address, you’re not signing up for anything other than to receive one email with a download link to the report. 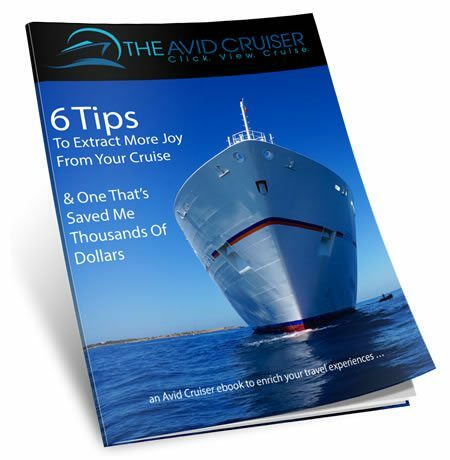 Please complete the form below to receive a PDF version of Six Tips To Extract More Joy From Your Cruise & One That’s Saved Me Thousands Of Dollars. I only see a way to subscribe to the news letter, not the report. I was already a subscriber. I subscribed again. I enjoy the newsletter. Six Tips To Extract More Joy From Your Cruise. It is a download for after you subscribe to the newsletter. What are the tips of upgrading airline seats for international travel? Buy points from lifemiles.com when they are on sale and use the points to book an international business class ticket. I have been using it for five years now and have flown business class across the Atlantic several times a year every year. Average cost of the entire ticket, each way, is around $800 to $900, a huge savings compared to the cost of buying a business class ticket outright. Several airlines is selling business tickets one way from the US to Europe for $ 8-900. No need to buy points to get that price. Good point. Those work great if you are in a city where those fares are available, New York, for example. But if you need to get to one of those gateways, then purchasing miles could be a better value. At any rate, there are many more options available now as low-cost carriers ramp up the competition. Not seeing this happen in Atlanta. Few bargain rates, although I did book a decent fare to Amsterdam for the end of July on Delta. The inexpensive fares from Atlanta always involve a connector or two. Turkish Airlines has some of these with two connections. No thanks. I have noticed that even the cruise lines advertising free airfare add a supplement from the Atlanta gateway. What are the tips for seats upgrade for internationa air travel?